There is still time to plant some vegetable seeds. The weather has been relatively mild, and it may be worth covering a small section of the garden with plastic to keep the rain off, whilst you get the seeds bought! These carrots from Australia are proof that they can grow carrots down under. 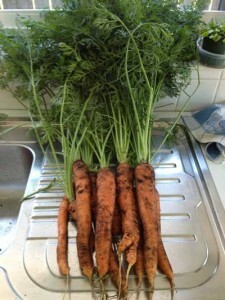 I am very proud of my godson who sent me this photo of the carrots that he has grown in Australia. Gill has just sent in this photo saying : Proof that if I can grow a prize winning carrot and parsnip anyone can!! You can use on TopVeg as proof of how helpful your website is : ) Thanks Gill!